Primo Aroma roasting company was born from the passion of two coffee experts, Corrado Bassanese and Fabrizio Polojaz. Skilfully selected coffee varieties from all over the world are separately reasted, air cooled and blended following the italian tradition of espresso. Besides own branded blends (Primo Aroma serenata, emozioni, romantica and desiderio), in beans, ground or in single doses, there is a significant production of private label coffee blends. Four bar blends in beans package with a valve to preserve the fragrance. 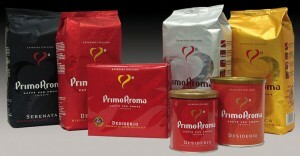 Desiderio consists of four types of coffee: three of Arabica (Central and South America) and one coffee of Robusta (Asian). It is available vacuum packs “bi-pack”, to maintain freshness for a long time. Primo Aroma espresso pods contain blends of high-quality, perfectly roasted, ground and pressed. It is also available decaffeinated espresso pod.